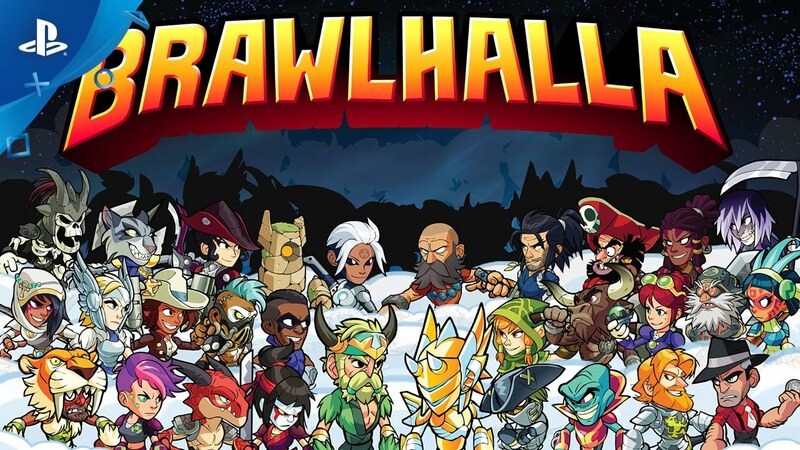 It’s time to take a look at Brawlhalla. I remember this game being brought up quite a bit back in the day when it first came out. It was supposed to be a FTP Super Smash Bros type game. Unfortunately while it is a platform fighter I can’t say that it is anywhere near the level of Smash. It’s a decent game, but one with more flaws than Playstation’s Battle Royale game. There isn’t a lot that will keep you playing as the years go by. Maybe recreating Super Smash is really impossible. It seems like everyone ends up failing at this task after all. There are a few main modes here. One of them is naturally going online to spar with other players. You can do so in team battles, 1 v 1, and free for alls. You can also play an online survival mode where you compete with other players to see who can score the most kills. Finally there’s also an offline training mode to tighten up your skills. When it comes to non gameplay content there is also a shop where you can buy other characters with a lot of gold. It’ll take you a very long time to get those characters if you are a free to play user. Still, with the daily log-in bonuses you are sure to get them eventually. There are other characters where the only option is to buy them with real money. One such character is Hellboy as the game is doing a marketing tie in for the movie. That’s fine, Rayman’s the only real notable character to nab and I can get him for free. It would take a lot of days though and I doubt I’ll be playing this game by then. The gameplay is fairly straight forward. You fight on top of a platform and the goal is to knock your opponent off the platform and prevent their recovery. Do this 3 times and you’ll have won the match. So far so good, but here’s where the game falters. Rather than just attacking each other to claim the win the game throws in a lot of items the whole time that can’t be turned off. Owning a weapon just doesn’t feel as natural especially since you’ll be throwing and tossing the weapons pretty quick. After a while you’ll find the right weapon for you and use that to win. Once you’ve done so, you can just keep grabbing that weapon every game. The characters barely even matter since once they have the weapons they all play in pretty much the same way. Character recoveries are also a little too good and end up dragging the match a bit. It’s not as bad as Playstation’s rule that you could only win by using a final smash. It’s still a bad one though because the weapons don’t feel like they’ve been designed all that well. The attacks don’t feel powerful and the weapons prevent you from getting in the hype. I know this game isn’t technically a button masher and you would definitely get wrecked online if you were to try it, but after a while you’re tempted to just keep swinging. The gameplay’s not really all that deep and I just don’t see the game lasting very long for a lot of people as a result. Then we come to the graphics which are all right I guess. It’s always nice seeing the sprites running around. They aren’t going to bring down the house or anything but the characters do look accurate. For example, Hellboy and Rayman’s sprite appearance looks pretty good. The soundtrack is less impressive and I doubt you’ll remember a single tune by the end of it. They just aren’t memorable and I feel like this part was more of an afterthought when developing the game. As for replay value, there is technically a lot here. There isn’t a story mode and so from the start you’re playing this purely for the multiplayer. These kind of games never technically end so the replay value is infinite. Really it’s all about how much you enjoy the gameplay because if you don’t then it’s not like you’re going to last for any significant amount of time anyway. For what it’s worth, I do think you’ll enjoy the game well enough. Especially since it’s free as that makes everything look a little better. Still, the game just isn’t too deep and there’s not much of a point to playing it when you’ve got Super Smash at the ready. There isn’t any area where this game is able to get to that high level. Overall, Brawlhalla isn’t quite as fun as I expected. I just thought it would be a little closer to Super Smash to be honest, but it really isn’t. Take the genre away and you don’t really see many other similarities. As the cast grows larger I can see this game improving in the future. After all, if people are still buying the game and the devs are getting their money then they may still see the incentive of adding more updates and mechanic changes. I can hope at least. In the meanwhile you may as well get the game and start stacking up on Gold so you’ll be able to spend it all once you decide to jump in. It’s a free game so you’re not losing any money. 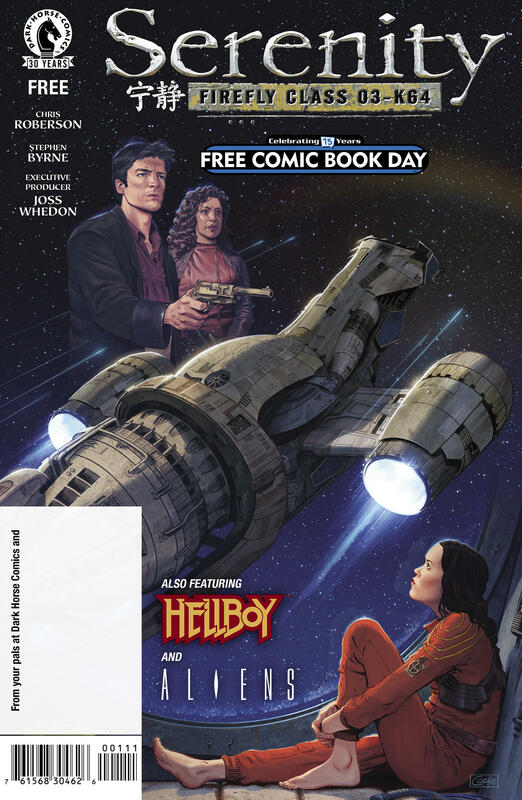 Time for another FCBD issue. This one brings three stories with it and unfortunately that increases the likelyhood that one of them will be a flop. That certainly does happen as this batch isn’t particularly strong. The main story features a character telling a little kid a story. Apparently it seems like this story is basically a remake of the first arc of the series. The living embodiment of wind met a skilled heroine and a noble pirate. Together, they decided to have some fun adventures and hang out. The plot twist at the end of the short is that the story was actually real and the main character’s Mom was the heroine. The art wasn’t really my cup of tea, but there’s nothing really wrong with the story. It’s a charming little adventure I suppose even if it didn’t really stick out. It’s better than sticking out in the wrong way like the next story though. Hellboy goes to these mysterious ruins where an old lady warns him not to mess with the spirits there. Hellboy scoffs and looks through the mirror where the spirits quickly begin to overwhelm him. Before he is eaten alive, he begs the old lady for help and she moves him away from the mirror. Rather than being apologetic or grateful he basically tells her to get away from him and sulks for a little while. His tough guy act was certainly shattered here since old/weak spirits can wreck him so easily. This comic certainly won’t make you a fan of the guy. The art is fairly consistent with the Hellboy franchise. The colors are faded and not very vibrant so it’s not quite up to DC levels of art, but it’s clear at the very least. A little underwhelming overall, but not that bad. This comic would have hurt the overall score a little more if the ending wasn’t so funny. It was unintentional, but you should get a good chuckle from it. The final story was an Alien one. A crew has been sent out to exterminate the entire Alien race one planet at a time. They are going through the route that the original ships went through to retrace their steps and find every possible place where Aliens may be hiding. The only problem? They weren’t prepared for this and the Aliens quickly overwhelm the heroes. They seem so shocked that you’d think they had signed up for Mountain Hiking as opposed to Alien Extermination. There is also an android on the team who doesn’t seem to understand that humans don’t play by the rules and can’t pull off perfect pivots or incredible precision like a robot. As far as alien stories go this one was actually quite boring and uneventful. You won’t be eager to see where the story goes and the art was fairly generic as well. None of the stories make for a great draw so this ends up being one of the weaker free comics. I’ve seen both of the Hellboy films, but I had not read any of his comics before now. I had to change that and now I can safely say that I have delved into the comics where it all began. Hellboy’s a good action title so far and we can be sure that he’ll face off with a lot of demonic beings before the day is over. This comic naturally goes over Hellboy’s origin a little. The Nazi’s summoned him during World War II, but the allies found him first and trained him to be a hero. 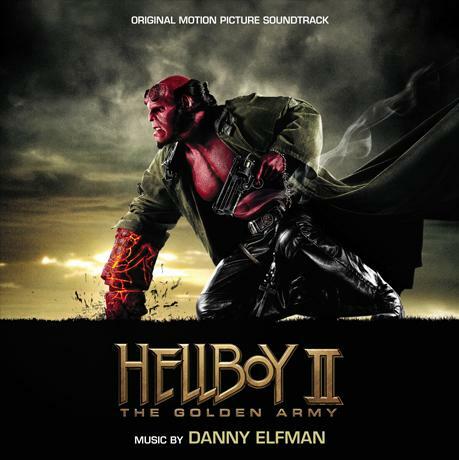 Hellboy joined a group of other supernatural fighters and he now aids them in the war against crime. It’s been 30 years, but the villains are still around. The main plot is about a family who constantly climbs a mountain in the hopes of getting rich. For 9 generations they have kept on trying to reach the top, but they continue to fail and all who travel the mountain eventually die. Hellboy’s father figure was the latest casualty in this quest so Hellboy and his team go to the family’s mansion to investigate. They may run into more trouble than they bargained for when they realize that an evil group is around..the same one from Hellboy’s origin! 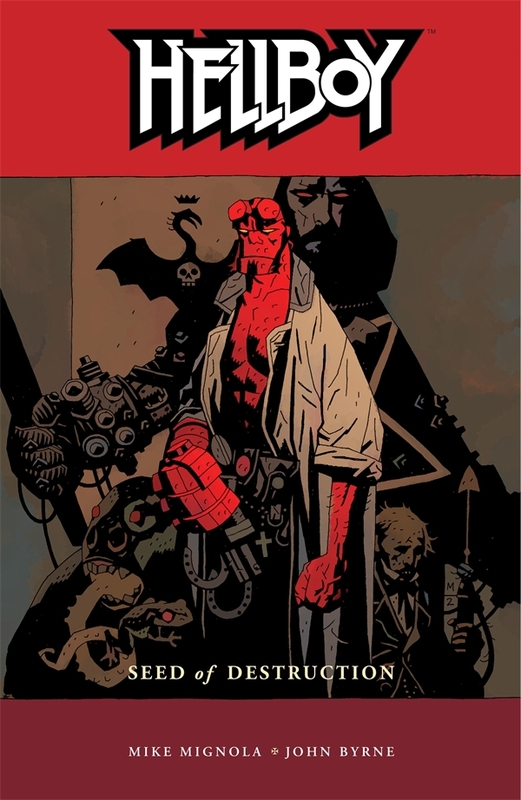 This is the first volume in the Hellboy comics so we’re still in the process of getting used to the cast. Hellboy’s allies from the films to get a role, but we mostly only get to know about them through Hellboy’s exposition since they tend to get knocked out of the fight pretty quickly. Abe is a water fighter who can breathe under it. 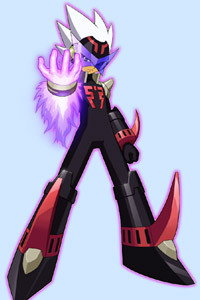 This makes him a good ally to have for tactical missions and he appears to be the smartest member of the group. That being said, he’s not much of a fighter and he doesn’t get much of a role here. He seems like a good character although he’s not particularly interesting. Liz gets a lot of hype as her fire abilities have not been fully explored yet. It seems like nobody can fully contain them at the moment so she has to always be careful not to cut loose. She is knocked out fairly early on in the story so it’s hard to comment on how likable she is, but Liz is decent for now. As with Abe, she doesn’t have a lot of character development and I’m worried that she will be all hype and no action, but she does have good reason to be confident considering that her abilities are easily the most impressive out of all the heroes around. Hellboy is the lead, but I would argue that he is not the strongest. 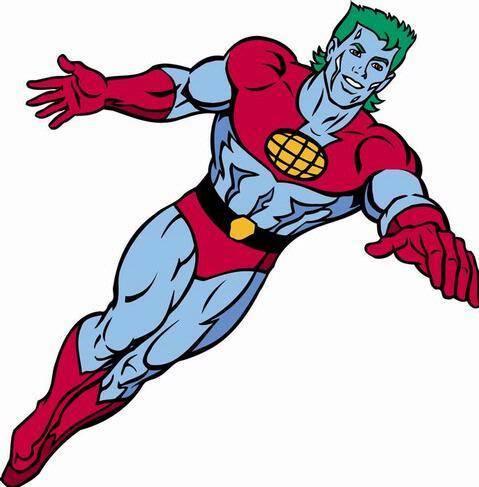 He has basic super strength and his right arm is impervious to pain. This means that he is definitely stronger than the average human, but he is only as strong as the average monster of that size. He’s pretty experienced and he always seems to have a plan. His narration can sometimes differ with that thought, but at least he never gives up. He’s pretty likable and easily the best character in the volume. It’s always good for the main character to end up being the most likable one because he/she is guaranteed to have a lot of screen time. Hellboy gets into quite a few close shaves, but that’s why he has allies to back him up right? The villains didn’t seem to have thought things over very carefully. There is one main villain here and he’s the guy who summoned Hellboy in the first place. Since Hellboy will not comply with his demands, he will have to force him to use his right arm for something. The guy has summoned the legendary monsters and his plans are vague, but deadly for the planet. He talks a very good game as he admits that he could wipe Hellboy out if he chose to do so. Little did he know that he should have held nothing back since it comes back to bite him. The art is on the grim side to fit the tone of the volume. That being said, it’s not meta at all, which is always a good thing. It’s not quite as polished as what you tend to see in today’s Marvel/DC comics, but it still looks good overall and doesn’t hold the series back. 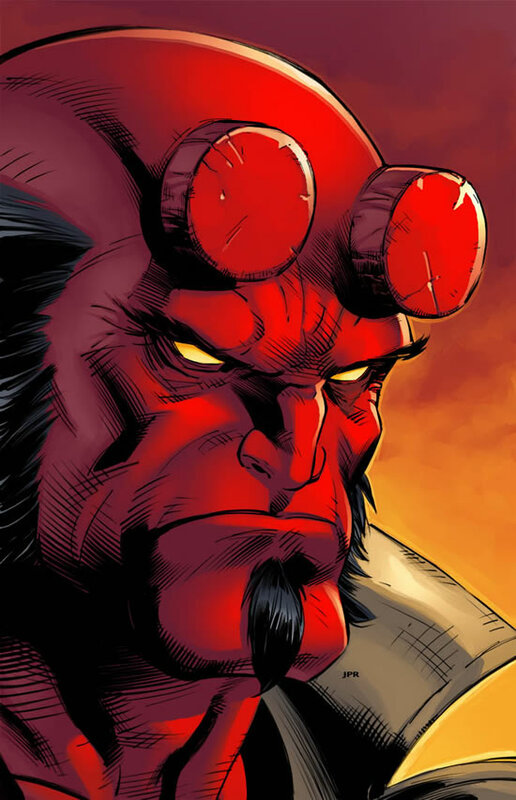 Hellboy’s red design certainly stands out here since there isn’t a lot of color to be found. It’s an art style that you may find nostalgic or associate with some comics from back in the day. It’s a little similar to the Hawkeye/Daredevil series, but not nearly as cartoony or undetailed, which is a good thing. This series definitely has a lot of text in it and it works in some ways while hurting it in others. On one hand, I like the fact that Hellboy is constantly thinking. His thought bubbles can certainly be amusing and it lets you get to know the character better than if he didn’t think that much. On the other hand, the series does have a lot of exposition and I think some of it could have probably been cut out. At the very least, I would have liked to have made the text a little bigger so that it would be a little easier to read. The main reason why this volume ultimately didn’t crack a 7 is just because it didn’t have enough popcorn entertainment or interesting characters needed to make it reach the next level. A 6 still means that it’s good, but that I simply have some more reservations than the average 7. For example, this comic likely wouldn’t have a whole lot of replay value compared to the average superhero adventure. As the series goes on and the characters get more likable, it could easily rise up to 7 status. Due to the dark atmosphere of the series, the writer/artist will still have to be careful to keep the atmosphere as it is without going too far. I’m sure that the series can pull it off though and hopefully we’ll see more cool monsters for Hellboy to fight. I’m not sure if the series will keep the mystery aspect that this volume had, but hopefully it will. A good mystery can always make a comic more exciting and mixing action with mystery is brilliant. Why do you think Batman is so popular? This was a good start and the series should stay episodic for a little bit so that we can really see how the agency fares against everyday threats. After that, then I expect to see some real organizations or at least a really powerful villain. Hellboy may need a power up soon. Overall, Hellboy starts us off on a good note. He’s definitely a good lead and the art works for the series. It’s an action with some elements of horror, but we haven’t seen anything that goes over the top in either direction so that’s a good show of restraint considering the title of this comic. The supporting characters do need to improve a little, but they’ll certainly have time for that. I recommend checking out this comic if you’re looking for a new action title. Watching Hellboy take on demons is pretty fun and the writing is good. 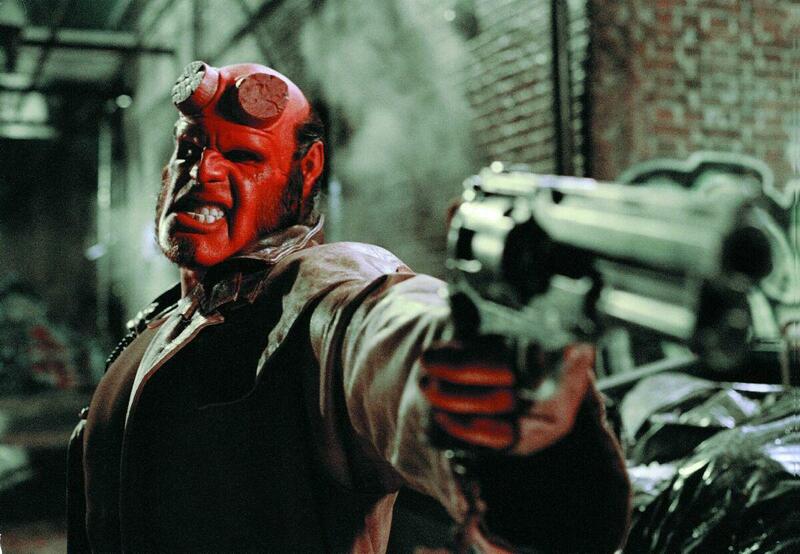 We’re still waiting for Hellboy 3, but this will help to tide you over until then. This is a tribute to Hellboy. Hellboy has his famous right hook, but that won’t be enough to stop someone as strong as Bly. Bly just needs one swing of the ole sword and this fight is as good as over. Hellboy drops down the ranks with this loss, but in the end he put up an admirable fight. Bly wins. Hellboy is back and he’s up against Kurse in this round! Well, Kurse has proven to be even stronger than Thor at some points which is pretty impressive! Still, taking on Hellboy may be tough with Hellboy’s super strength and all. In the end it won’t be enough. Kurse wins. Hellboy hasn’t fought in a while, but he’s no match for Spawn. 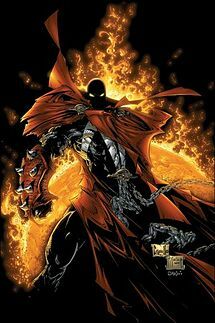 Spawn’s abilities are pretty intense and he has a lot of them. Hellboy’s good with a gun, but in the end, I don’t think it will be enough to take down Spawn. Spawn rises up the ranks with this win. Spawn wins. Jason Voorhees is back to fight Hellboy. 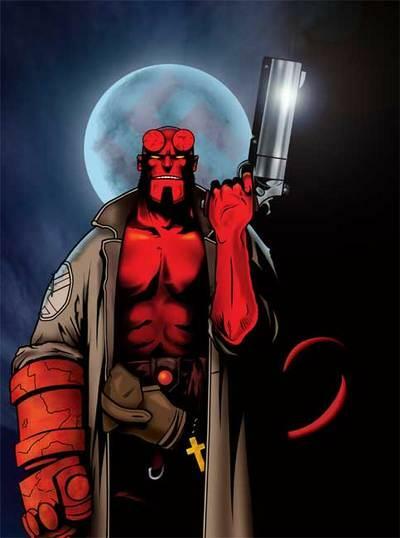 Hellboy has a pretty big gun that can do some massive damage. 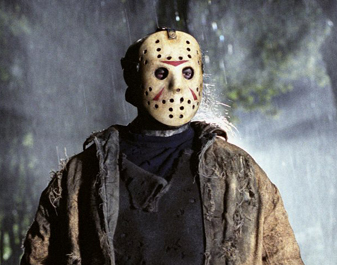 Jason Voorhees may be tough to destroy, but this time he’s met his match. Hellboy’s also pretty strong and possesses a healing factor. With these abilities taking him down is a pretty tough feat. Hellboy wins. 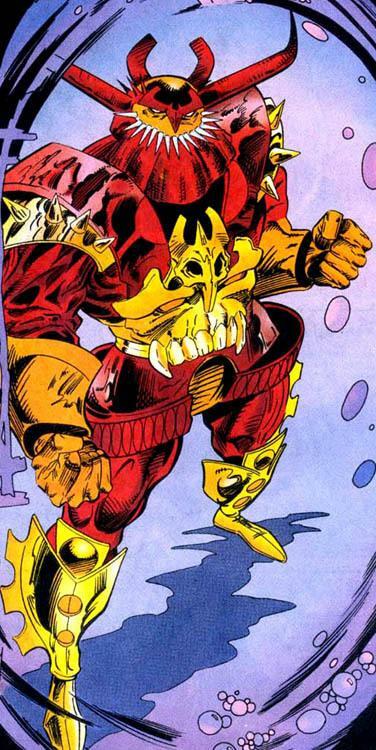 Doomsday has enough super strength to take down many fighters in an instant. Hellboy may be powerful, but one full on punch from Doomsday and he’s dead. 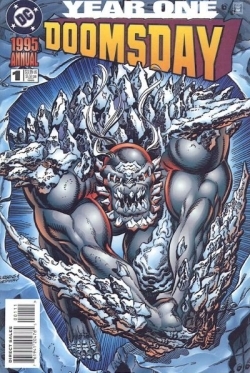 Doomsday was even able to fight the legendary Superman at one point! That’s something to think about. Hellboy may be back, but he came back for a loss. Doomsday wins. Hellboy is pretty tough and this match could change someday, but as of now Vengeance takes this match. 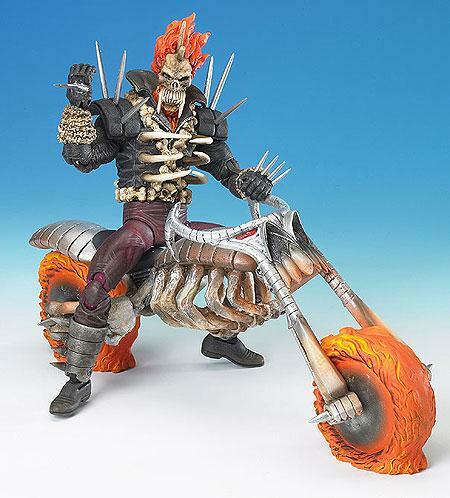 With his motorcycle he is a pretty tough opponent. He takes this match and ups his record to a place where Hellboy won’t follow. Vengeance wins.